If you were around in the 80s you would have seen the birth of a new hair trend. I didn't call it a style and when you see the pictures you'll know why. 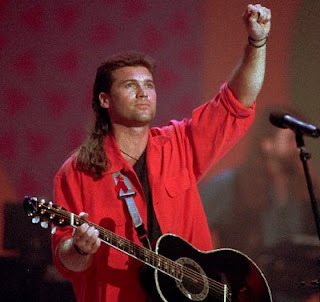 The Mullet was the perfect solution for anyone who wanted long hair but couldn't be bothered dealing with the hassle. Best of both worlds - short around the sides and front to keep hair out of your eyes and out of your way while doing stuff and long silky locks in the back to show the world you were actually a badass. Click the pic of the patron saint of mullets to see a definitive guide to mullets and a gallery of every kind of mullet recorded to date. Truly an archive for the ages. When it comes to mullets, I'm all for keeping it Retro but I do have my limits!